Prostate cancer (PCa) accounts for ~26,730 deaths annually in the United States and remains the most commonly diagnosed malignancy in men, despite recent decreases in screening.1 The majority of new cases are localized or locally advanced. Owing to early detection and slow disease progression rates, the 5-year survival rates for newly diagnosed localized/regional PCa patients (Stages I-III) approach 100%. However, up to one-third of early stage patients will develop recurrence after curative intent therapy, often with metastatic disease, and these Stage IV patients have drastically lower 5-year survival rates. Primary treatments available for early stage PCa patients include radical prostatectomy (RP), radiotherapy (RT), and/ or appropriate androgen deprivation therapy (ADT) with LHRH agonist/antagonist or first-line antiandrogens with or without chemotherapy. Treatments for progressive castration-naïve local/metastatic disease include orchiectomy or ADT. Although ADT remains the frontline gold standard in treating advanced prostate cancer, resistance develops with time, and the disease progresses to a state of castration-resistance (metastatic castrate-resistant prostate cancer (mCRPC)). The last 7 years have seen a marked improvement in the therapeutic options available for mCRPC with FDA approvals for many agents. These include two secondary hormone therapies – the antiandrogen enzalutamide (2014) and the CYP17A1 inhibitor abiraterone acetate (2012), a cytotoxic agent cabazitaxel (2010), a radiopharmaceutical Radium-223 (2013), and the RANKL mAb denosumab (2010) for bone metastasis, and sipuleucel-T (2010), the first immunotherapy approved for the treatment of asymptomatic or minimally symptomatic mCRPC. The median survival of CRPC patients with symptomatic metastasis is ~2 years even with the available options. New agents that can improve the quality of life for patients with metastatic disease as well as those agents that can improve overall survival (OS) and demonstrate durability of response are still desirable in this patient segment. Newly diagnosed patients who present with metastasis (bone or soft tissue) are currently treated with ADT, with <1 year of median failure-free survival (FFS)* and <2 years of median OS.2 A study evaluating the pattern of care and outcomes among patients newly diagnosed with metastatic prostate cancer (from 2004 to 2013), reported that 5-year OS for patients receiving local therapy (RP or RT) to treat the primary disease was 45.7% versus 17.1% for those not receiving local therapy,3 suggesting a synergistic effect. Nevertheless, new therapies that could delay progression to CRPC will continue to be needed in this niche. Patients with non-metastatic CRPC (M0CRPC) currently have no approved therapies that may delay disease progression and represent a large area of unmet need. M0CRPC is defined by rising PSA level under ADT with a castrate level of testosterone and in the absence of clinically detectable metastatic disease. Clinically, castrate levels of androgens are maintained with ADT and these patients are often referred to ongoing clinical trials. Among patients with M0CPRC, about one-third will develop bone metastasis within 2 years. In recent trials, denosumab significantly prolonged bone metastasis free survival (33.2 months compared with 29.5 months with placebo) but there was no difference in OS (median, 43.9 months with denosumab vs. 44.8 months with placebo) or progression-free survival (PFS).4 There is some evidence that immunotherapy can be successful in this patient segment – there was a trend to improved OS in M0CRPC patients randomized to initial treatment with a poxvirus-based PSA vaccine compared to initial treatment with the antiandrogen nilutamide (median 6.2 years vs. 3.7 years; p = 0.045; n = 20).5 This suggests a survival advantage for M0CRPC patients if treated with an appropriate immunotherapy prior to ADT. Immunotherapy designed to induce tumor-specific immune responses capable of destroying tumor cells has emerged as a promising treatment modality in solid malignant tumors. Despite the modest outcomes seen with checkpoint inhibitor monotherapies in prostate cancer, much can be learned from clinical trial data and correlative studies of these agents. Immunotherapy studies so far in prostate cancer have harnessed two main strategies: vaccination and checkpoint blockade. Cancer vaccines aim to stimulate immune cells to recognize malignant cells as foreign, thus initiating an immune reaction. Cancer vaccines such as Sipuleucel-T, PROSTVAC-VF, DCVAC/PCa, GVAX, ONY-P1, etc. all employ this immune-stimulatory strategy. Sipuleucel-T, an autologous cell vaccine, demonstrated a survival advantage of 4.1 months in mCRPC and is currently the only approved immunotherapy for prostate cancer. Sipuleucel-T appears to enhance multiple immune functions and antigen spreading following treatment. Evidence with sipuleucel-T in mCRPC patients underscores the relevance of immune responses in prostate cancer that can translate to clinical efficacy. Three other vaccine platforms, PROSTVAC (PSA-TRICOM), DCVAC/PCa, and ProstAtak are in advanced stages of development in the metastatic (PROSTVAC and DCVAC/PCa) and localized neo-adjuvant (ProstAtak) settings. 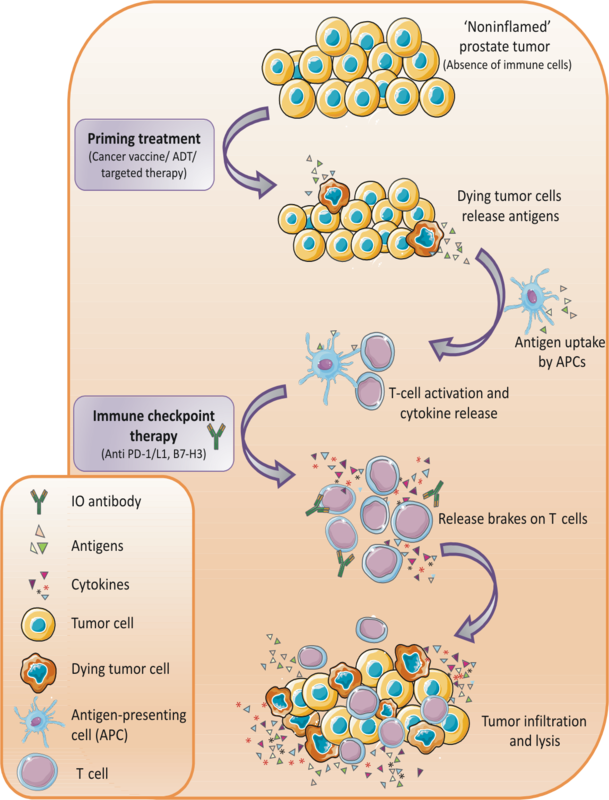 The second class of agents is immune checkpoint inhibitors which are antagonist monoclonal antibodies that act as immunomodulators and potentiate antitumor immunity by targeting checkpoint regulatory proteins. CTLA-4, PD-1, and PD-L1 are the most well-studied checkpoint proteins, while B7-H3, LAG-3, and CD38 are being targeted in many Phase I trials. Immune checkpoint blockade affects interactions between several immune components and the tumor, which in turn could modulate the tumor microenvironment. Tumors employ inhibitory checkpoint signals to prevent stimulating T-cell activation, thus checkpoint blockade enables the immune response to proceed uninterrupted against tumor cells. 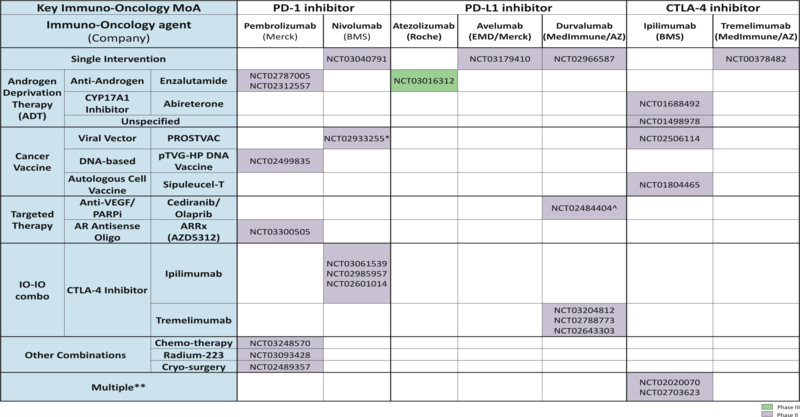 Ipilimumab, pembrolizumab, nivolumab, atezolizumab are examples of a few checkpoint blockade agents being tested in various PCa trials, mostly in advanced stage disease (Table 2). Anti-PD-1 therapies have demonstrated sporadic responses as single agents in unselected patients. Studies are assessing whether biomarker analysis of tumor cells can provide clues as to who will respond to immunotherapy. Pembrolizumab is currently being used in the US for mismatch repair (MMR) deficient prostate cancer. MMR-deficient PCa is known to have higher levels of PD-L1 positivity and immune cell infiltrates. Early evidence is also available showing that PD-1 blockade produces anticancer activity in trial patients selected for advanced PD-L1-positive CRPC.9 This trial with pembrolizumab (KEYNOTE-028) elicited durable responses even among heavily pretreated patients.9 A currently recruiting Phase II trial will stratify mCRPC patients by tumor PD-L1 status and presence of bone metastases before treating them with pembrolizumab (NCT02787005). New peripheral biomarkers are also being sought to aid in the prediction and measurement of response to immunotherapy treatment, as well as markers that would enable the prediction of toxicity. This would allow targeted therapy for individuals most likely to benefit from immunotherapy, providing a rationale for the use of such high-cost treatments and a basis on which truly individualized treatment plans could be formulated. To date, immunotherapy has been investigated predominantly in advanced disease, where the immune system may have been suppressed and impaired by previous treatments, disease burden, and associated comorbidities. Immunotherapy could potentially be more effective when administered early in the course of the disease and many current trials are focused on this possibility. A better understanding of the natural history of changes within tumors treated with immunotherapy is also needed. Although immune checkpoint inhibitors appear to have modest activity as monotherapy in the broader PCa population, preclinical and clinical data suggest that they may synergize with other agents. Several clinical studies that combine these therapies are currently underway (Table 2). Tumors with poor T-cell infiltration such as PCa (traditionally considered a ‘cold tumor’) may require a stimulus to get the immune system to seek, recognize, and destroy the tumor (Fig 1). This can be achieved by combining IO with agents that can boost tumor antigen release and mobilize key immune players. Evidence suggests that immune checkpoint inhibitors may be more active in inflamed tumors characterized by immune cell infiltrates. Combination strategies that both direct the immune players to the tumor and allow effector cells to infiltrate and remain functional within the tumor microenvironment will be optimal. Trials of immune checkpoint inhibitors in combination with other MoAs and in Phase II or III clinical development are ongoing (Table 2). Taken together, there is a strong biological basis for immunotherapy in the treatment of prostate cancer in combination with ADT, but the particulars remain ambiguous. For instance, are all methods of attaining androgen scarcity the same in terms of inducing immunogenicity? Even though there is a consensus that ADT has immune modulatory effects, the impact of the different agents of ADT (LHRH antagonists/agonist, antiandrogens, abiraterone, etc.) on T-cell function, antigen-presenting function, and immune recognition needs to be defined separately and more clearly. This information will help guide the optimal ADT(s) to be used in combination with a specific IO. *FFS was defined as time from randomization to evidence of at least one of the following: biochemical failure; progression either locally, in lymph nodes, or in distant metastases; or death from PCa. Observational studies have shown that a significant proportion of mCRPC patients (19.3%) harbor somatic mutations in BRCA1/BRCA2 or ATM (DNA damage repair genes). This suggests that targeting DNA repair enzymes such as PARP (poly [ADP-ribose] polymerase) may propel the tumor cells into a state of distress and antigen shedding. Olaparib is a PARP inhibitor that received breakthrough designation from the FDA for PCa patients with BRCA 1/2 or ATM germline mutations. Findings from a study that examined mCRPC patients treated with olaparib suggest that the drug is highly active in this subpopulation of patients.18 Combination studies of PARP inhibitors with PD-1 blockade in prostate cancer are ongoing (Table 2). Other targeted agents being combined with PD-1 blockade include the VEGF receptor inhibitor cediranib and an AR antisense oligonucleotide (Table 2). Exploratory preclinical studies focusing on the effect of chemotherapy (oxaliplatin) in combination with IO (anti-PD-1 treatment) found that oxaliplatin stimulated the immunogenic potential and established a pro‑immune microenvironment in CRPC cells and enhanced the response of prostate cancer to anti-PD-1 treatment.19 This combination may be another option for CRPC patients. Combinations of various checkpoint blockade therapies are also being tried in the clinic for prostate cancer. Anti-CTLA-4 and anti-PD-1 therapies affect the immune system in different ways, offering the potential for synergy when given in combination. But any improvements in immune response will need to be reconciled with the increased toxicity expected with this approach. One such Phase I trial of ipilimumab with nivolumab had a >50% PSA decline in 1 of 15 ARV7+ mCRPC patients.20 This combination has progressed to Phase II for mCRPC patients with the immunogenic signature of defective DNA repair or MMR as identified by IHC/targeted sequencing panel (NCT03061539). The relatively modest success with immune checkpoint monotherapy in prostate cancer could have been due to the absence of effector T cells within the tumor microenvironment. Immune checkpoint inhibitors may still be viable as therapeutics for prostate cancer when used in combination with other agents. Currently, ADT is the primary treatment for all stages of prostate cancer and is ideally suited to be used in combination with immunotherapy treatments for prostate cancer. The various agents used for ADT also differ in their effects on immune function. Although there is no doubt that ADT has immunomodulatory effects, there is no comprehensive comparison of the various agents on the synergistic effects or lack thereof when combined with IO therapy. Single-agent immune checkpoint inhibitors appear to have a modest activity and potential utility only in select patients. The lack of clinically meaningful immune response endpoints has been partly attributed to an increased understanding of tumor heterogeneity and polyclonality during the progression of prostate cancer to late-stage disease (even treatment-induced polyclonality).27 Each metastatic site in CRPC patients could be composed of subclones harboring distinct driver mutations, which may promote both disease progression and tumor immune evasion. Moving forward, effective therapeutic combinations in CRPC patients may have to be driven by the analysis of tumor-specific genomic and gene expression alterations in distinct clonal populations. In conclusion, while the treatment landscapes of melanoma, NSCLC, urothelial carcinoma, and hematological malignancies have been transformed by immune checkpoint inhibitors, they appear to have had only modest activity as monotherapy in prostate cancer. Evaluating previous and ongoing immune checkpoint clinical trials in prostate cancer have led us to some key forward-looking questions: How can we leverage the information we have about the MoAs of emerging agents, to guide rational combinations with immunotherapy that will result in meaningful therapeutic outcomes? Can we identify the factors involved in the successful IO responses observed in a few patients and replicate them in the larger population of PCa patients? Answers to these questions will permit the successful development and approval of IO agents which will add another useful tool in the therapeutic armamentarium for prostate cancer. Siegel RL, Miller KD, and Jemal A, Cancer statistics, 2017. CA Cancer J Clin. 67(1):7 -30, 2017. James ND, et al., Survival with newly diagnosed metastatic prostate cancer in the ‘Docetaxel Era’: Data from 917 patients in the control arm of the STAMPEDE trial (MRC PR08, CRUK/06/019). Eur Urol. 67(6):1028 -1038, 2015. Parikh RR, et al., Local therapy improves overall survival in patients with newly diagnosed metastatic prostate cancer. Prostate. 77(6):559 -572, 2017. Smith MR, et al., Denosumab and bone-metastasis-free survival in men with castration-resistant prostate cancer: Results of a phase 3, randomised, placebo-controlled trial. Lancet (London, England). 379(9810):39 -46, 2012. Madan RA, et al., Analysis of overall survival in patients with nonmetastatic castration-resistant prostate cancer treated with vaccine, nilutamide, and combination therapy. Clin Cancer Res. 14(14):4526 -4531, 2008. Beer TM, et al., Randomized, double-blind, Phase III trial of ipilimumab versus placebo in asymptomatic or minimally symptomatic patients with metastatic chemotherapy-naive castration-resistant prostate cancer. J Clin Oncol. 35(1):40 -47, 2017. Kwon ED, et al., Ipilimumab versus placebo after radiotherapy in patients with metastatic castration-resistant prostate cancer that had progressed after docetaxel chemotherapy (CA184-043): A multicentre, randomised, double-blind, phase 3 trial. Lancet Oncol. 15(7):700 -712, 2014. Cabel L, et al., Long-term complete remission with ipilimumab in metastatic castrate-resistant prostate cancer: Case report of two patients. J Immunother Cancer. 5(1):31, 2017. Hansen A, et al., Pembrolizumab for patients with advanced prostate adenocarcinoma: Preliminary results from the KEYNOTE-028 study. Ann Oncol. 27(6):243 -265, 2016. Polkinghorn WR, et al., Androgen receptor signaling regulates DNA repair in prostate cancers. Cancer Discov. 3(11):1245 -1253, 2013. Aragon-Ching JB, Williams KM, and Gulley JL, Impact of androgen-deprivation therapy on the immune system: Implications for combination therapy of prostate cancer. Front Biosci. 12:4957 -4971, 2007. Drake CG, et al., Androgen ablation mitigates tolerance to a prostate/prostate cancer-restricted antigen. Cancer Cell. 7(3):239 -249, 2005. Koh YT, et al., Androgen ablation augments prostate cancer vaccine immunogenicity only when applied after immunization. Prostate. 69(6):571 -584, 2009. Akins EJ, et al., In situ vaccination combined with androgen ablation and regulatory T-cell depletion reduces castration-resistant tumor burden in prostate-specific pten knockout mice. Cancer Res. 70(9):3473 -3482, 2010. Ardiani A, et al., Androgen deprivation therapy sensitizes prostate cancer cells to T-cell killing through androgen receptor dependent modulation of the apoptotic pathway. Oncotarget. 5(19):9335 -9348, 2014. Graff JN, et al., Early evidence of anti-PD-1 activity in enzalutamide-resistant prostate cancer. Oncotarget. 7(33):52810 -52817, 2016. Gao J, et al., VISTA is an inhibitory immune checkpoint that is increased after ipilimumab therapy in patients with prostate cancer. Nat. Med. 23(5):551 -555, 2017. Mateo J, et al., DNA-repair defects and olaparib in metastatic prostate cancer. N. Engl. J. Med. 373(18):1697 -1708, 2015. Pfirschke C, et al., Immunogenic chemotherapy sensitizes tumors to checkpoint blockade therapy. Immunity. 44(2):343 -354, 2016. Boudadi K, et al., Phase 2 biomarker-driven study of ipilimumab plus nivolumab (Ipi/Nivo) for ARV7-positive metastatic castrate-resistant prostate cancer (mCRPC). J. Clin. Oncol. 35(15):5035, 2017. Liu X, et al., Selective inhibition of IDO1 effectively regulates mediators of antitumor immunity. Blood. 115(17):3520 -3530, 2010. Hamid O, et al., Epacadostat plus pembrolizumab in patients with advanced melanoma: Phase 1 and 2 efficacy and safety results from ECHO-202/KEYNOTE-037. Ann. Oncol. 28(5):v428 -v448, 2017. Lu X, et al., Effective combinatorial immunotherapy for castration-resistant prostate cancer. Nature. 543(7647):728 -732,2017. Gulley JL, Immunotherapy & Prostate Cancer, 13th Annual Meeting of the National Alliance of State Prostate Cancer Coalitions (NASPCC), October 2017. Antonarakis ES, et al., Sequencing of sipuleucel-T and androgen deprivation therapy in men with hormone-sensitive biochemically recurrent prostate cancer: A Phase II randomized trial. Clin. Cancer Res. 23(10):2451 -2459, 2017. Morse MD and McNeel DG, T cells localized to the androgen-deprived prostate are TH1 and TH17 biased. Prostate. 72(11):1239 -1247, 2012. Hong JH and Kim IY, Nonmetastatic castration-resistant prostate cancer. Korean J. Urol. 55(3):153 -160, 2014. McNeel DG et al., The Society for Immunotherapy of Cancer consensus statement on immunotherapy for the treatment of prostate carcinoma. J. Immunother. Cancer. 4(1):92, 2016. Schellhammer PF, et al., Lower baseline prostate-specific antigen is associated with a greater overall survival benefit from sipuleucel-T in the Immunotherapy for Prostate Adenocarcinoma Treatment (IMPACT) Trial. Urology. 81(6):1297 -1302, 2013.